It’s November 1st! Have you started planning the menu, making shopping lists, configuring seating arrangements, finding decor and all of those other items that need to be ready for Thanksgiving? I like to have a deadline and there’s no better deadline than a holiday where you’re having people over to get things checked off the list. 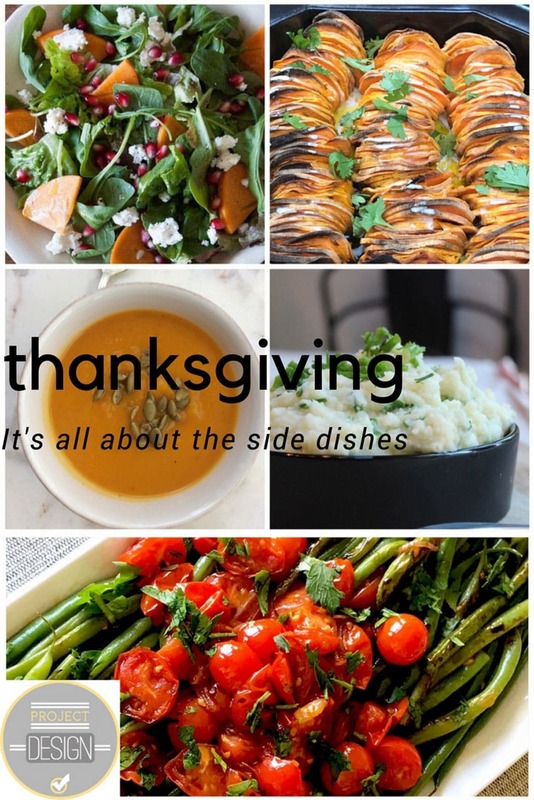 I’ve teamed up with four other bloggers for Project Design, only instead of a decor related post like our Fall Tablescapes, it’s all about Thanksgiving side dishes. 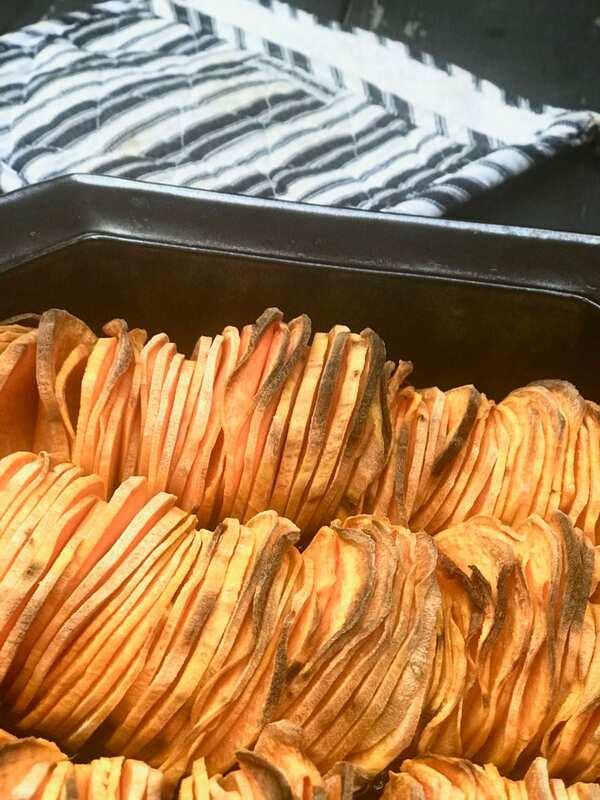 Right away, I knew I was going to do my favorite side– sweet potatoes. 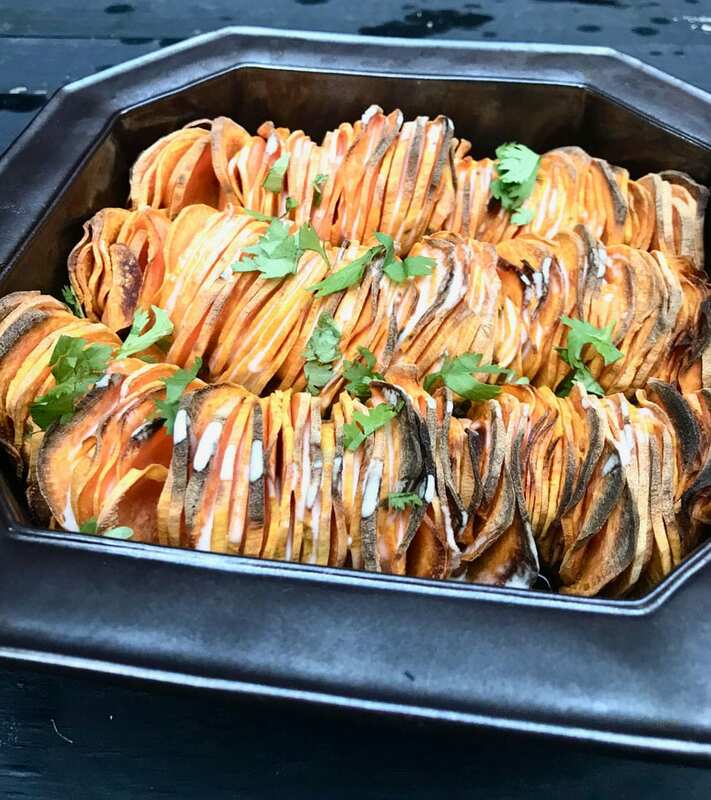 Not just any sweet potatoes, but sort of a crispy layered dish with lots of butter and a sriracha cream sauce. Yes, it’s loaded with calories, but it’s Thanksgiving! 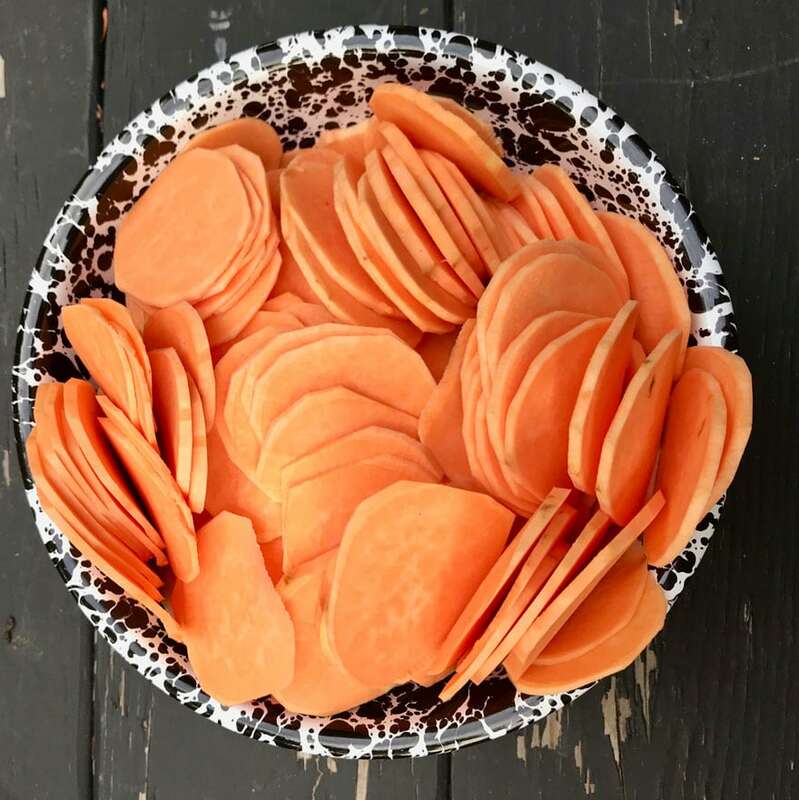 A delicious sweet potato Thanksgiving side dish. 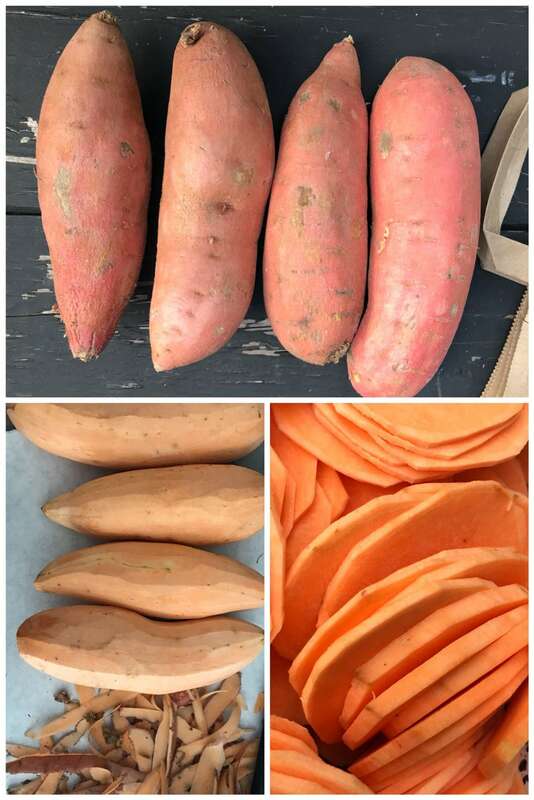 Using a 9 x 9 pan, start by choosing four sweet potatoes that are similar in size and shape. This makes it easier to slice and arrange in a pan in rows or in a circle depending on the shape of pan. 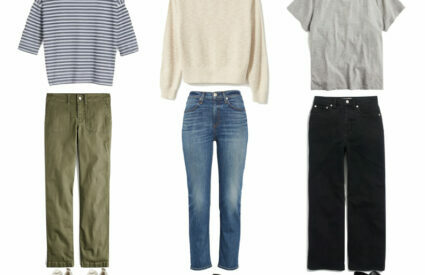 They will all be a little different, but that’s what creates the layered look. Scrub them and then peel and cut off the ends. Using a Mandoline makes it a lot easier and then they are all the same thickness. 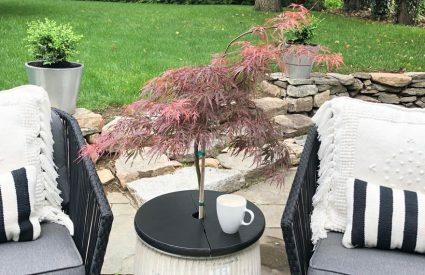 I used to have a big fancy one, but this one takes up very little space and it works great! I always use a cut resistant glove when I use a Mandoline. The Mandoline blade is so sharp and it’s easy to have an accident. No one wants that on Thanksgiving morning! Brush a coating of the oil and butter over the inside of the pan or skillet. 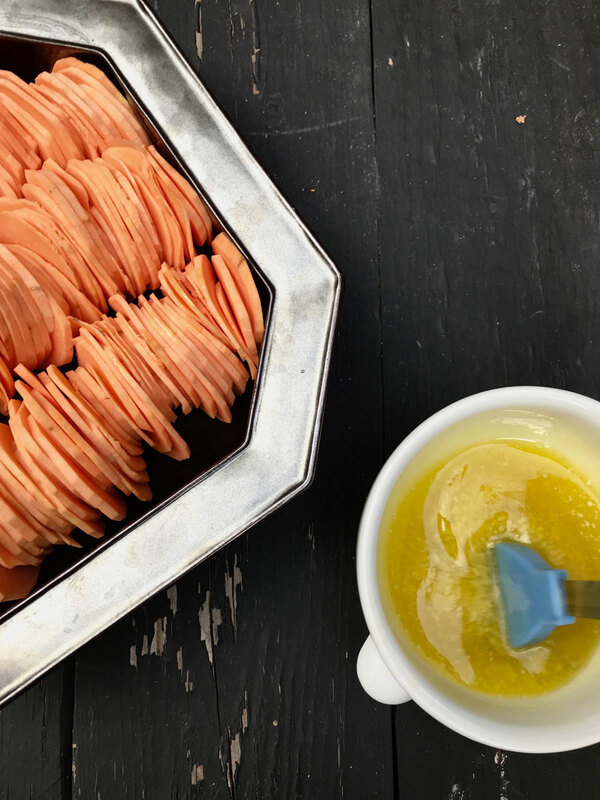 Then begin layering the slices of sweet potatoes in the baking pan or skillet, brush the entire pan with the melted butter and olive oil mixture. Just keep brushing until it’s gone. Cover with aluminum foil and bake for approximately 45-55 minutes in 375º oven until they are almost fully cooked. Remove the foil and increase the heat to 425º and bake for another 10-15 minutes until they start to look like they are getting crispy. 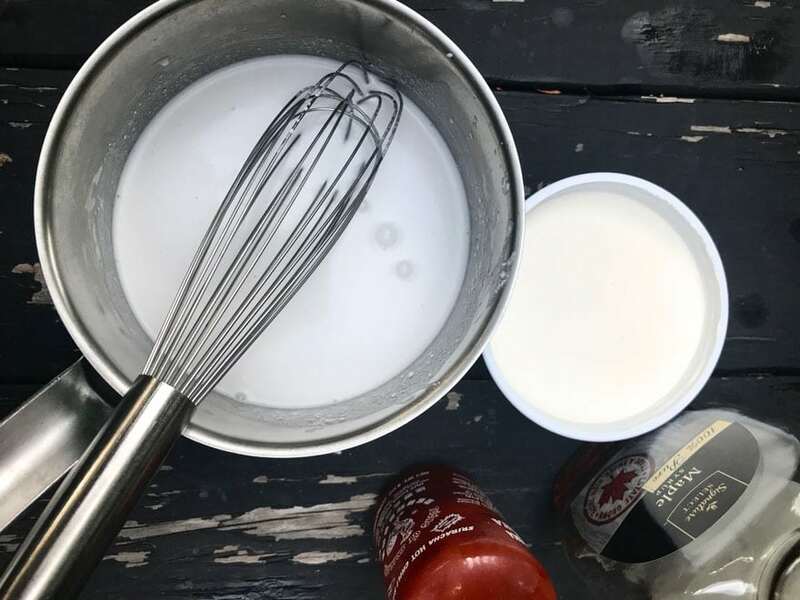 In a small sauce pan, mix heavy cream, crème fraîche, sriracha, and maple syrup and whisk over low heat until it is warmed, but make sure not to boil. Pour over the sweet potatoes and sprinkle with fresh cilantro. I save a little of the sauce and serve in a small pitcher along side the sweet potatoes so you can drizzle a little extra. Make sure you head over to see what Mary Ann, Cindy, Janet and Melaine are making as part of their Thanksgiving! Wow…that looks so delicious I want to make it tonight! But I will wait for Thanksgiving so that I have others to help polish it off! 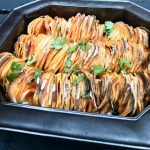 I am not a sweet potato fan but this recipe actually sounds good!! Beats the heck out of those sugary sweet marshmallow numbers!! I DEFINITELY WILL TRY THIS………..THANK YOU! Thanks for reading! And I’m loving your videos! Who would have thought to use pockets to tie a kimono? 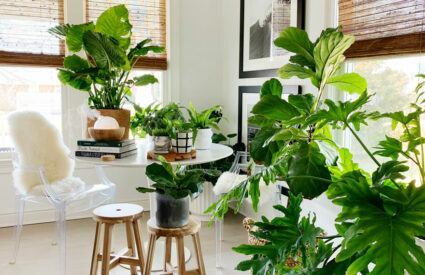 So smart and of course I need the step by step, so the video is perfect. 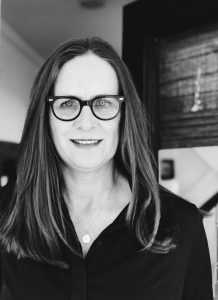 Annie, first of all your blog redesign is beautiful! Second, I’m so excited for all these recipes for Thanksgiving. I’m hosting our family of foodies; it’s hard to find something new that is not experimental. You had me at sriracha and creme fraiche! Thank you so much! It still needs a little tweaking (like the logo), but still much improved. Hope you have a wonderful Thanksgiving with all your family home…I think you have a college freshman too?